Thank you Ann Taylor for partnering together on this post! 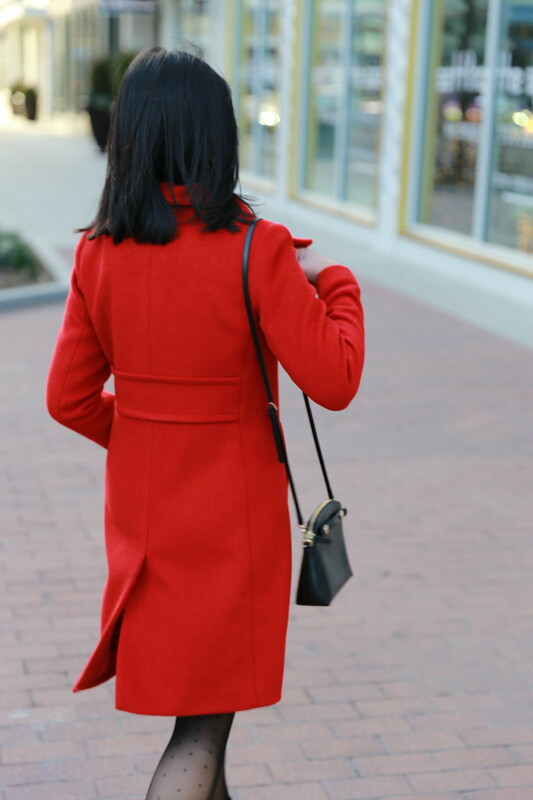 This red funnel neck coat is a classic piece that makes a statement. Wearing this festive color immediately puts me into a holiday mood and adds a little pep in my step. This little black dress is minimalist with a perfectly tied bows on both shoulders. The bows are sewn in place so they won’t come undone. These sheer dotted tights complete this dressed up holiday outfit while still showing off these gorgeous black heels with mini bow straps. Lastly, I couldn’t resist picking up a pretty pair of sparkly earrings and a bow ring when they were on sale last week. This post is sponsored by Ann Taylor but all opinions are my own.